There are many ways that paint ends up in carpet. Maybe your little Van Gogh got a little too enthusiastic and painted the carpet instead of the paper. Maybe you’re repainting a room and dripped a little bit. Maybe a can of stored painted tipped and spilled. No matter how the paint there, you may be feeling hopeless. Paint is notoriously hard to remove. However, it’s definitely not impossible At Chem-Dry, we’re in the business of removing stains, and we’re here to share our best paint removal tips with you! The first thing you need to do is evaluate whether or not that paint is still wet. There are slightly different ways to treat wet and dry paint. Of course, it’s always easiest to treat wet stains, so if you catch the spill in time, act fast. However, if you weren’t so lucky, you can sip down to the dry paint section. The most important thing to remember when cleaning paint is not to scrub the spill! This is most people’s first instinct; however, this will push it deeper down into your carpet fibers and make it more difficult to remove. Instead, you are going to want to soak up the paint with a white towel or paper towel. Be sure to choose a plain white towel with no designs on it. The color dye can transfer into the wet carpet and make the stain even worse. Simply lay the towel on top of the stain and let it absorb the moisture. Scrubbing or blotting will only make it worse, so let it be, changing out the towel when it is saturated. Repeat this process until there’s little or no moisture left. Once the moisture has been removed from the stain, let the paint dry overnight. This sounds counterintuitive, but once you’ve removed all of the moisture, letting the stain dry is the easiest way to clean it. Once the paint is dry, continue reading to the next section. Once your paint is dry, there are a few methods you can try to remove it. We recommend trying one, and then moving onto a different one until you find something that works for your particular spill. Be patient. Paint can come out of carpet if you work at it! If you are completely sure that the paint is dry, simply use a rag to vigorously scrub the stain. You should see bits of dried paint come off in pieces. Keep at it until all of the paint has flaked off. Then, vacuum the area well to remove all of the paint flakes. 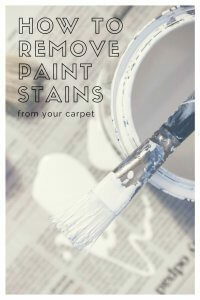 You can also use a knife or razor blade to scrape the chunks of dried paint off of the carpet strands. Just be sure to be careful not to cut your carpet. This method should only be attempted by adults. Especially if you have a lighter colored carpet and the color remains after trying one of the above, try nail polish remover. Use a brush or towel to gently dab it onto the affected area. Avoid using too much remover, as this can eat away at the adhesive on the back of your carpet. You will slowly see the paint stain begin to fade. Repeat this process several times if necessary. Once the stain is removed, go over the carpet with a wet rag, then again with a vacuum. Give WD-40 a try. It comes in spray form, can be found at most home improvement stores, and works well at breaking down tough stains like dried paint. Spray the affected area with the WD-40 then let it sit for about 25 minutes. Gently dab the area with a white cloth, rinse it clean with water, and then vacuum the area clean. If nothing else works, give your local professional carpet cleaner, such as North American Chem-Dry a call. Professionals have more heavy-duty cleaning solutions that can remove stains that homeowners can’t. There you have it. Hopefully, it should be easy to remove any paint spills you encounter in your carpets!